Much like value, “art” is in the eye of the beholder. After all, someone just paid $17.5 million dollars for Damien Hirst’s “The Kingdom” piece, which is a tiger shark preserved in formaldehyde. Truly illustrating that price has no relation to cost, Mr. Hirst reportedly purchased the shark for $200 from an Australian shark hunter. Damien Hirst is the popular British artist whose central artistic theme is death as illustrated by embalming animals in formaldehyde. Death must be in vogue these days as he is considered to be the most expensive living artist, a title he garnered in 2007. Never one to rest on his laurels, a diamond encrusted platinum skull he created recently sold for $100 million dollars. And while these prices seem high, to date owning Mr. Hirst’s work has been a great investment. ArtTactic research claims that the value of his work has increased by a compounded annual rate of 39% since October 2004. On September 15 & 16, Hirst took the unprecedented step of commissioning Sotheby’s to auction off 223 pieces of his recent work. This is unusual, as there’s an unwritten rule that pieces under two years old should be sold through galleries. Galleries take a standard 40% - 50% commission on the sale price. Speculation is that Hirst bypassed the galleries in favor of “passing go” to collect a higher percentage of the proceeds through an auction. 223 pieces in 2 years! I mean, a good day for me is writing two single spaced pages for my book. 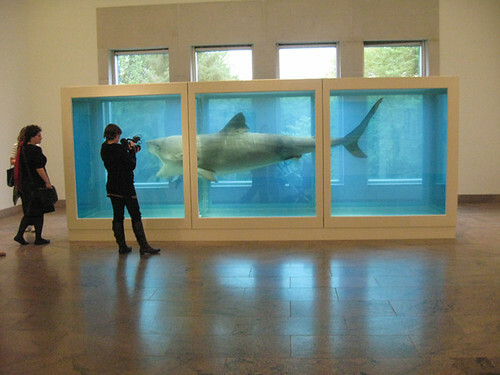 Hirst comes up with the ideas and then often works with his team to produce the work. Team Hirst employs over 120 people which David Cohen of the Evening Standard claims includes entry level welders and art school graduates who start at 9 British pounds per hour. One unidentified assistant interviewed in Cohen’s article quit because she resented being paid 600 pounds for a piece that eventually sold for 600,000 pounds. Again revealing that price is about capturing value, not cost. Mr. Hirst’s Sotheby auction was a resounding success. Blowing past Sotheby’s estimate of $120 million, sales were over $198 million. What makes this auction more astounding is that these prices were garnered on two of the worst days in the history of financial markets. Here’s where it gets murky…the art world is beginning to wonder if the sales truly represented the works’ values or if they were propped up by art dealers who are selling Hirst’s other work. For example, the White Cube gallery in London reportedly has a stock of over 200 Damien works valued over $180 million. Low auction prices would affect this value. According to The Sunday Times, business associates of Mr. Hirst, who have an interest in maintaining his work’s value, reportedly made bids or purchases accounting for over half of the crucial first day’s sales.